Freshly-baked cookies warm the soul. Whether simple, common recipes or more elegant, complicated kinds, there’s just something about biting into their sweetness that, if only for a brief moment, makes everything all right. The following places in New Hampshire are the best cookie places in the state. Pick up a dozen the next time you’re passing by. And don’t forget the milk on your way back home! Enjoy giant homemade cookies at Ceres Bakery. Bring some home or stay and enjoy one with coffee or some of the most indulgent hot chocolate around. Be sure to check out their themed, iced cookies ahead of most holidays. You’ll find delicious cookies at Frederick’s Pastries. Choose from chocolate chunk, reverse chocolate chip, sugar, oatmeal, and more. Cookie trays are available to order and are perfect for parties, showers or just to spoil your friends at work. If you find yourself in or near Hudson, you really must stop at Benson’s Bakery & Café. In addition to delicious fare in the café, the cookies in their bakery are sublime. 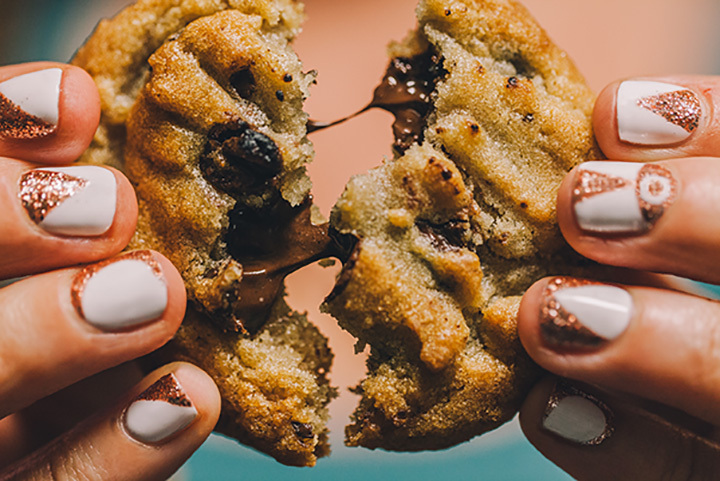 The S’mores cookies are like something from a dream. You’ll picture yourself sitting by a campfire—they’re that good. Benson’s also makes snickerdoodles, double chocolate, and chocolate chip cookies, too. Harvey’s Bakery & Coffee Shop is the perfect place to enjoy a cookie and a cup of coffee. Featuring several decadent homemade options each day, you’ll have to bring a dozen home to the family—after enjoying your own, of course. You’ll be hard-pressed to leave Harvey’s without at least one or two additional types of baked goods as well! Sweet Dreams Bakery is one of those little places you’ve always meant to stop into, but simply haven’t bothered. It’s time you did. If you love cookies, this is the place to be in Stratham. More than a dozen options for freshly baked cookies are available each day. They include oatmeal raisin, peanut butter chocolate chunk, Italian cookies, Russian teacakes, pecan sandies, chocolate chip, and more. For the ultimate French cookies—macarons—be sure to visit La Maison Navarre. Macarons are made from almond flour and meringue and are filled with a wide variety of fillings and flavored in countless ways. Their colors sometimes make them appear way too good to eat. But eat them! Here’s a little secret about the macarons at La Maison Navarre: Eating just one is never enough! The cookies at St. Anthony’s Bakery in Exeter are nothing short of miraculous. The perfect combination of flour, butter, sugar, and countless additional ingredients result in a nice selection of cookies. Stay and have a cup of coffee and chat with the regulars that meet there almost every morning. Indulge in chocolate chip, peanut butter, oatmeal raisin, and several other cookie choices. Choose from a wide array of homemade cookies at the Crust & Crumb Baking Company in Concord. Their shortbread cookies are a year-round favorite, and that’s likely because of the varieties they offer. Their shortbread options include Stracciatella (shaved chocolate and sea salt), maple, vanilla, coffee, lemon poppy and Baker’s Whim—and these are just the shortbread cookies. In addition, you may choose from molasses crinkle, chocolate chip, chocolate monster, flourless peanut butter, flourless chocolate cookies, and more. Lots of cravings can be satisfied here! Triolo’s Bakery bakes up several classic cookie recipes each day. Choose from chocolate chip, peanut butter, ginger snaps, oatmeal, shortbread, and Unicorn Poop. That last one is clearly popular with the kids! In addition, they make iced shortbread and a wide array of decadent Italian cookies. Consider a cookie platter as a hostess gift! The cookies at Riverstones Bakery vary by day, but all are made with wholesome ingredients like real butter. Take a coffee break and enjoy a cookie or two in the morning or the afternoon. You’ll be sold, not matter which kind you opt to try. You’ll love the service here, too. The owners are very down-to-earth and personable—even though they put out some of the best baked goods in this region. It clearly hasn’t gone to their heads!